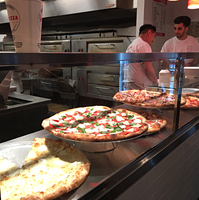 Joe's Pizza, one of New York City's favorite pies, is now in Times Square. Located near Broadway and 40th Street, Joe's is best known for its classic pies made with fresh mozzarella and tomato sauce or as Joe's like to say, "no pretentious concoctions." You are able to get additional topping, but most folks opt for a regular slice or square. You really can't go wrong. Joe's has been around for 40 years and it's Greenwich Village location truly is a New York institution.